Consulting | Business Improvement S.r.l. Building on its more than twenty years experience in the field of services and technologies for the domestic market Industry and Services ( Education , Health and Social Affairs ) and due to its strong vocation for the best methods and practices transfer from one context to another one, BUSINESS IMPROVEMENT follows its customers to optimize their production processes, addressing investments efficientness over time. To this end, we provide a wide range of consulting services, proposing the best and most proper improvement strategies, balancing and coordinating technical and structural measures of behavioral interventions on human resources. BUSINESS IMPROVEMENT implements projects for optimization and improvement of business processes, with particular reference to the processes related to the Product Life Cycle (primary processes, according Porter Model), but also refer to auxiliary processes (Purchasing , Human Resources, … ) and capability ( Configuration Management , Security, etc. . ). Our expertise , gained through years of experience in the field of industry, allows us to act quickly and safety in critical areas in order to restore conditions of optimal effectiveness and efficiency . The approach typically involves an initial assessment extended to the organization of interest, so as to outline a project that addresses at 360° weaknesses, acting in parallel on processes , products but also on skills. BUSINESS IMPROVEMENT is active in the field of Safety Assessment with particular reference to the applicable methodology in the field of systems in support of Air Navigation . It adopts an engineering approach, referring to what was expressed historically in the foundations of the MIL -STD- 882c inherent in the “System Safety Program Requirements”. The aim of our approach is to provide a coherent frame of reference to the regulatory ESARR4 – Risk assessment to mitigation plan to provide assurance that a system intended to support the Air Navigation is safe for operational use too. BUSINESS IMPROVEMENT conducts relevant studies and projects in the environmental sustainability for Projects to be realized. On the basis of the acquired knowledge and continuous research on the latest technology, the goal is that the BUSINESS IMPROVEMENT aims to give a contribution to improving the state of the environment and the protection of environmental resources, according to the logic of sustainability and environmental balance. We define the Risk Management Model tailored on our Customer Organization. Simulation / Strategic Analysis . Several successful experiments confirm Model and Approach reliability (derived from International Standards ). The Suppliers Presidium, based on tutoring techniques, in order to maximize returns and minimize the supply chain management costs. Since 2010 VALFOR has been enriched by a component that allows the evaluation of the economic and financial risks related to the supplier and the entire supply chain, verifying by simple algorithms ready-to-use, with proven efficacy for evaluation of the risk fallibility. Since 2010, BUSINESS IMPROVEMENT has been active in the definition of Organizational Models according D.Lgs. 231/01, in order to prevent administrative offenses . Nowadays many Italian Regions (e.g. Regione Lazio) consider mandatory to have an active organizational model for all Healthcare organizations affiliated with the National Health Service. We have developed a specific approach to be proposed in Organizations that already rooted and implemented a Quality Management System (QMS) ISO 9001. 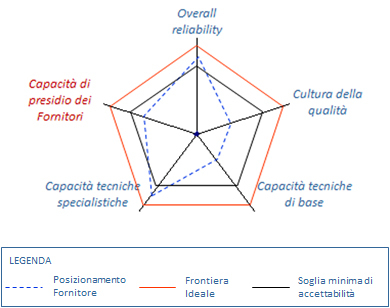 In fact, subject to the requirements of independence, impartiality and objectivity of the organizational and management model adopted in such cases we consider essential to design the two systems in a comprehensive and coherent frame, avoiding any risk of redundancy , ambiguity, uncertainty rules and operators. With our approach, many of our customers have been able to exercise organizational models that are entered immediately into full operation , without significant additional costs and capitalizing into Organization even a widespread awareness of the responsibilities inherent in acting business at any level. We support our clients in achieving and maintaining Accreditations for Product, Process and System , in both civil and military context. In particular, we have made significant Accreditation Projects according to international standards UNI EN ISO 9001 , EN 9100 , AQAP , EASA Part 21-145, E-TSO. Maximize the confidence of its customers.